During the past few weeks I’ve partnered up with 12 other health activists on the Internet to bring you an amazing online event about food, health, and spirituality (some of my very favorite topics!). We’ve all been interviewed and will be sharing our stories as part of the Body and Spirit Summit 2014! Healthy foodies and mind + soul experts from all over the world will gather to combine our lifetime experiences and encourage you to become the absolute best expression of yourself. Everything I write about is already about this, and the platform of an online summit is nice because you get to hear from a diverse range of people spanning different opinions, mindsets, and approaches – then, you get to discern what feels right in YOUR heart and leave the rest behind. 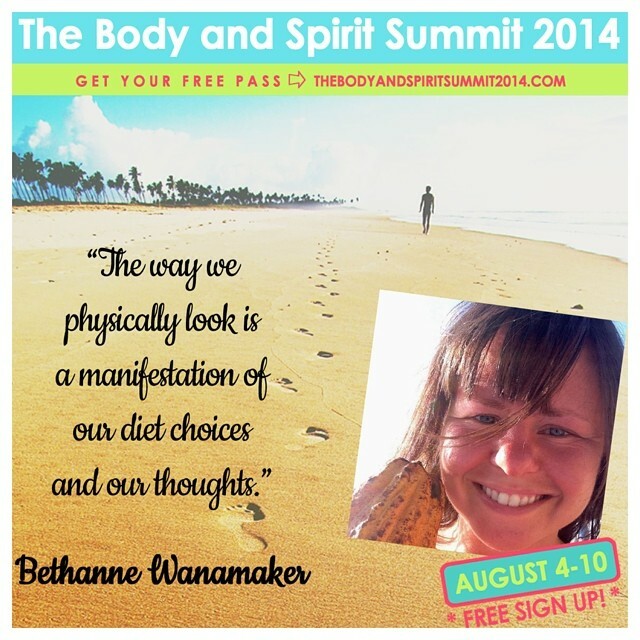 If you’re feeling ready to truly grasp why and how you become what you eat on the physical, emotional and spiritual level, you’ll really find great value in this summit! My interview is being featured today through tomorrow, and you can listen in at no charge. I feel like a rebel at times; you see, I’m an integrated part of this food summit but really I believe it goes MUCH deeper than that. With the right information, you can easily master your nutrition. I actually trust that you already know what is best for you. You don’t need someone else to tell you… but I feel that because of many of the food choices we’ve all made either recently or a long time ago (with artificial flavors, refined sugars, genetically modified foods injected into our food supply), that there are layers in our consciousness that need to be peeled like an onion before we can really tap into our innate wisdom. That’s what I talk about in this interview. Yes, I share about my own food choices, but mostly I share about how to create the life you want. Getting back to my favorite topics – are you happy with how you’re living your life? Spending your days? The choices you’re making? Do you recognize your potential and the cosmic power you hold within?